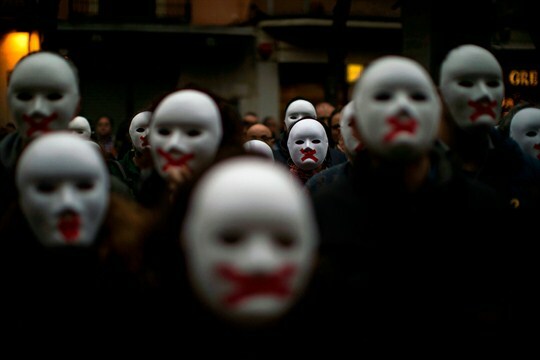 People wear white masks in support of Catalonian politicians jailed on charges of sedition during a protest in Figures, Spain, April 5, 2018 (AP photo by Emilio Morenatti). BARCELONA—Catalans now know what happens when an unstoppable force meets an immovable object: A lot of noise, but little movement. For the past six months, Catalan separatists and the Spanish government have been deadlocked. The separatists insist on the legitimacy of the independence referendum last October and Catalonia’s right to secede from Spain. The Spanish government is adamant that the referendum was illegal and that the region cannot break away. Senior Catalan activists and politicians have been arrested, charged with inciting rebellion and sedition, while Catalan home rule has been suspended by Madrid.